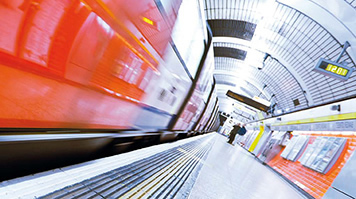 London South Bank University (LSBU) and Transport for London (TfL) have a long standing partnership that encompasses award winning research and consultancy projects like cooling the London Underground. Alongside this, LSBU also provides professional training to TfL staff, such as the employer-sponsored Quantity Surveying training scheme. We caught up with Andrew Crawley, TfL’s Commercial Manager, to talk about the importance of staff training to the organisation and the wider industry, which is currently facing a shortage of surveyors. When did TfL start sponsoring staff to study, and why? AC: It’s something the organisation has always done. This particular scheme – Quantity Surveying – is something that’s come on line in the past few years. We’re finding that increasing numbers of candidates are coming via this route now, as opposed to graduate recruitment. They’re looking at the financial implications of doing a degree, and choosing instead to earn and learn at the same time. Of course, they have to accept it’s going to take that bit longer to get qualified – five or six years, typically, as opposed to the three years it takes to do a traditional degree – but there’s a big advantage to be gained from being able to apply their knowledge as they go. Quantity surveying isn’t just a theory or a concept, it’s what they’re doing every day. What kind of issues can employer sponsored study help to tackle? AC: Currently, the industry is facing a shortage of surveyors, particularly ones who are qualified to degree level. Our aim is first to ensure that Transport for London and London Underground have access to some of the best surveyors in the industry to support our capital programmes. But beyond that, we see it as part of our responsibility as a publicly-funded body to do something to address that skills shortage. It also helps us to achieve a better balance between supply and demand, so that employers – including ourselves – don’t have to fight each other for access to a dwindling pool of graduate talent. Finally, if good people are put off becoming a quantity surveyor by the cost of studying, that has a negative impact across the board. We want our workforce to be as diverse as the city we serve, so it makes sense to remove that potential barrier to entering the profession. Tell us how the partnership with LSBU came about. AC: The relationship with LSBU was really born out of practical considerations – put simply, we needed a university that could provide the right course for our needs. But it’s evolved over time. LSBU has a strong track record in the built environment and engineering, and more generally in vocational education and that’s something that really resonates with us. It’s about equipping people to do a job. But that's not to say the practical stuff doesn't matter. AC: We currently have around 20 students studying to become quantity surveyors, six at LSBU and the rest working for their level 3 qualification at the College of Estate Management. They must complete that qualification before they can move on to level 6. AC: Our students get a day off each week to study. All their costs are met, and they are paid for their time, too. It’s very different to my own experience of studying for a degree while working, if I had opted for day release there were discussions about reducing my pay. What are the key challenges involved in sponsoring staff to study? AC: You have to remember that these are young people. They haven’t been to university. That represents an opportunity, of course, in that we are able to shape them and instil our values and ethos. But it also means recognising that we’re on a journey with them, in terms of their maturity. They’re learning all the soft skills – like time management and coping mechanisms – as well as all the job-related stuff. They really develop as people over the period of the degree. There are some practical challenges too. It would be useful to have a bit more information about what happens at university, such as details about attendance. That’s down to the law on data protection, but new disclaimers will be coming into effect soon that will allow LSBU to share more information with us. It’s not about snooping – it’s about being able to identify any issues that might be affecting someone’s studies or their work as early as possible, so we can actively support them. AC: We give our students a day off whenever they have an exam, and another day off to prepare. As far as managing absence goes, I think it’s inevitable that there will be challenges, particularly as students spend more and more time with us and get more deeply involved in projects, but managing time and juggling priorities is all part of the learning process. AC: All our students rotate through a number of placements, lasting either six months or a year. They’ll be assigned a placement manager, who’s responsible for monitoring them on a day-to-day basis. Then they’re paired with a more senior student, who acts more like a buddy. Finally they have a sponsor, too. I’m the lead sponsor for this scheme, with three colleagues working with or for me. Our role is less hands-on, and mainly pastoral. We’ll help them with university applications, personal statements, support them through personal issues! We also have an Apprentice Support Manager, an impartial person they can talk to about any problems. And of course, our HR team is working to ensure that all our schemes are fit for purpose and that we’re turning out surveyors with the right competences, as well as providing a further point of contact. The students also slot into TfL’s company-wide appraisal process. AC: Sponsored study meets our expectations 100%. The surveyors we’re turning out are driven, they know how to manage their time, they’ve worked all over the company so they have a really broad understanding of what we do. They’re innovative and creative, and keen to look for new ways of doing things. They’re in tune with our ethos and values. And they definitely bring an influx of energy into the workplace. It’s an opportunity for some of our more senior members of staff to pass on their very valuable experience too. AC: I’m not sure I can put a figure on it – but there are definitely intangible benefits. If you invest in people, they will react positively. They can see that we think they’re worthwhile, and that we’re committed to helping them succeed. There’s a clear path, and opportunities to grow and progress. What are your plans for the future, and what opportunities do you see ahead? AC: We are part of the employers’ consortium that has been working on the government’s Trailblazers degree apprenticeships initiative, developing new standards for apprenticeships at levels 3 and 6. We are very keen to play our part in supporting closer collaboration between the professional body (RICS) and the training providers and industry. It’s in all our interests to make sure that the learning on offer reflects ‘real world’ needs. That’s an ongoing commitment for us – these standards will be reviewed every three to five years. Beyond that, we’re also looking at expanding the scheme to cover different strands of surveying, although I don't think we’d be looking to increase the overall numbers. The level of supervision needed puts considerable demands on our resources, as does the need to provide quality placements for all our students. Read about employer sponsored study at LSBU, and our opportunities in undergraduate and postgraduate Quantity Surveying.